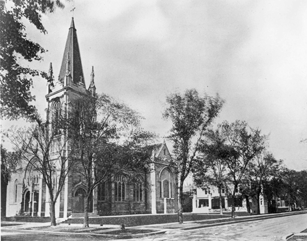 In June 1907, construction of St. Edmund's Church was completed amid great fanfare and celebration in Oak Park. The fact that the church was built during a period of religious intolerance was testament to the commitment of the parish founder and pastor, Father John C. Code, as well as the personal involvement of John Farson. Though Farson was not a Catholic, he lent his property at Home Avenue and Pleasant Street ( Pleasant Home) to Code and the parish for a fund raiser and spoke at the event. His actions helped inspire greater public tolerance of the young parish. Of the $100,000 construction cost for the church, Mrs. Mary Mulveil donated $50,000. In an Oak Leaves story at the time, the dedication St. Edmund's Roman Catholic Church was accompanied by "imposing ceremonies," with rites performed by His Grace, the Most Reverend Archbishop Quigley. The Archbishop traveled to Oak Park from Chicago by car, and was met and escorted to the church by Oak Park councils of the Knights of Columbus. Other dignitaries included Bishop Edmund Dunne of Peoria and Bishop Carroll of Helena, Mont. Henry J. Schlacks designed the church in the style of English Gothic Revival. The imposing and striking exterior features a stainless-steel steeple topped with a Celtic cross. Above the entrance, a marble carving depicts the namesake of the church, St. Edmund of Canterbury. Inside a series of large stained-glass windows display selected scenes from the Gospels. Today, as the oldest standing Catholic church in Oak Park, St. Edmund's remains a religious and architectural landmark at the northeast corner of Oak Park Avenue and Pleasant Street.